What can you prepare at New Year Eve dinner? There are so many recipes that sometimes it is difficult to decide what to serve as starter, main course, side and dessert at New Year Eve. I hope that these 4 dishes can be useful to you in many other occasions of this 2014. I had a frozen puff pastry in my freezer so I decided to prepare savory croissants as starter. I also prepared homemade Gnocchi as main course. As side, I made lentils as good luck and Banana Bread as dessert. As dessert I served cheese and grape. Happy New Year’s eve to all of you! Divide the smoked ham counting that you need to fill 12 croissants. Cut the ham into half lengthways. Cut the cheddar cheese into cubes. Roll the puff pastry out and cut it in half. Make 12 triangles with base 9cm. Once you obtained the triangles, practice a small incision in the center of the base of each triangle. Enlarge the pastry slightly, fill the triangles with cheddar cheese and smoked ham. Add rosemary, then wrap each triangles. Bent towards the center of the lateral extremities and also close the tip of the croissant. Brush the croissants with egg white and cover with oregano. Preheat the oven and bake them to 180 degrees Celsius for 15 minutes, until golden- brown. You should have 10-12 Savory Croissants to serve, which depends on the size of your triangles. Place and serve as starter. Set aside. I decorated the dish with hearts shaped omelette. Homemade Gnocchi are amazing and so easy to prepare and so perfect for New Year Eve dinner. For ingredients and preparation please have a look to my previous post about Potatoes Gnocchi. As soon as your gnocchi are cooked, dress your potato gnocchi with butter and sage for example. 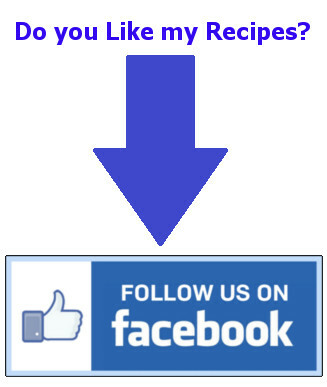 In my previous post, I explain how to cook Lentils. According to tradition, lentils symbolize prosperity and money, as they have similar shape to that of coins. For this reason, in Italy during the New Year’s Eve you eat lentils (often as an accompaniment to gammon or pork sausage), as a symbol of luck for the new year. Cover lentils with water all the night before. The following day (New Year eve’s), drain the lentils and cook as I explained in my previous post. Put all the ingredients in a large casserole. Add as much water than you need to cover the ingredients. Let the lentils and vegetables cook until tender. Mix time to time, add water if the level is too low. Tip: This will prevent the lentils from sticking to the bottom or burn too. lentils are cooked when tender so do the vegetables added. Only at the end, add oil to the lentils. Set aside, serve after the main course. As third course you can serve cheese and grape. 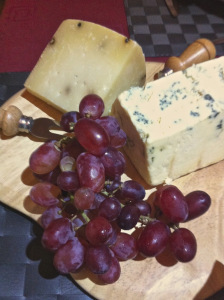 I bought a selection of cheese at any supermarket and I served with grape. The dessert is Banana bread : For the recipe you can have look at my previous post. You can serve banana bread later for example at midnight to celebrate the new Year. Asti, the Italian spumante, is perfect with banana bread. 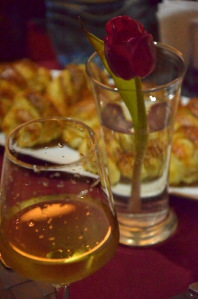 The combination of the flavour of Banana Bread and the sparkling of the Italian Spumante was amazing. Decorate your table as you like. I am sure that you dinner will be a success and all your friends will love it as much mine did. I wish you an Happy New Year and a wonderful 2014.